This little galvanized bucket my sis gave me as part of my B'Day earlier in the month, has been sitting on the Baker's Rack in my old seed box. I thought I'd give it a little special attention, since the orange tulips really pop against the other pastel Spring blooms. This is my latest "rendition" on the Baker's Rack. 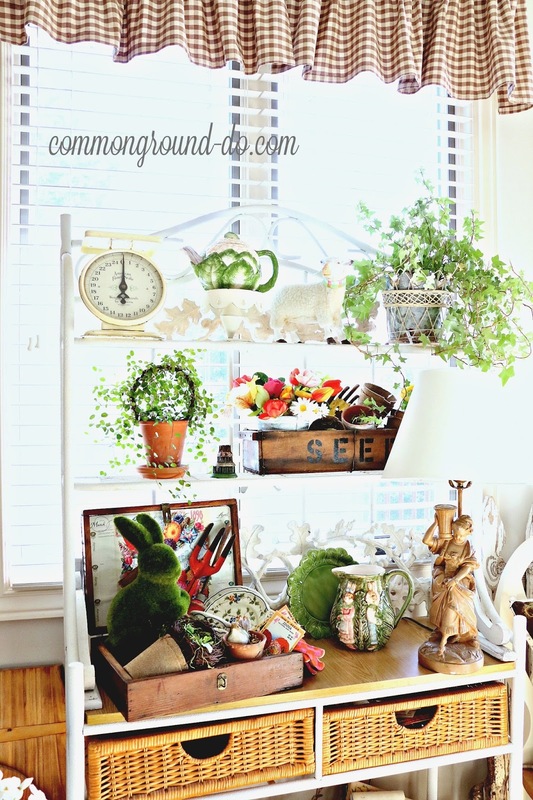 It's been "Springified", but I have a few other things I'll use for Easter. 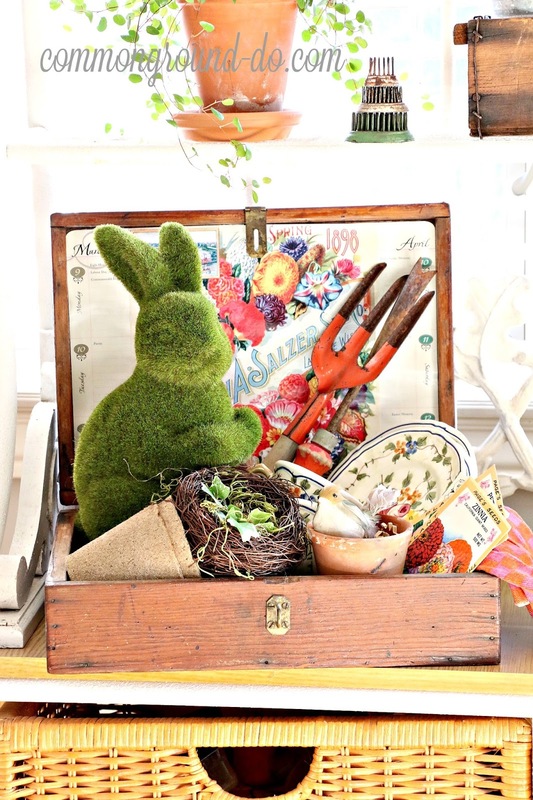 With the turn of the calender for April, I'll bring in a few more bunnies, baskets, and pastels. and just the right size for the Seed Box display. So, this one's new to the fluffle. My little Cauliflower Teapot is perched on the Cupcake Stand. Old garden tools, a few peat pots, a nest, and some seed packets share the space with a few of my French Faience Cups and Saucers. whoops, I believe someone has laid an egg in one of those cups! I'm using my vintage European grain sack with the caramel stripe, that I found several years ago. 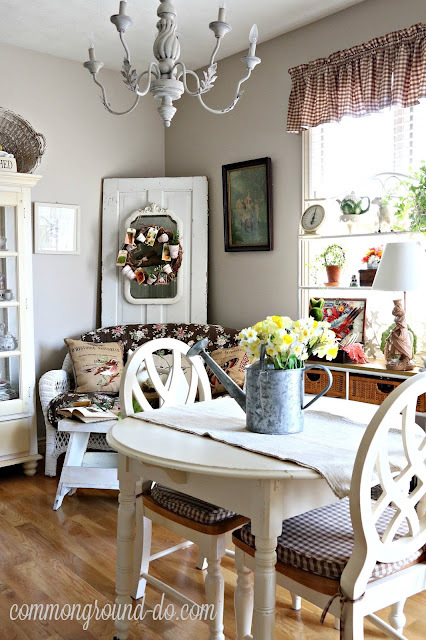 I had taken the seams out originally to use on my Dining Room table, but recently sewed them back up so it would fit this little round table, here in the kitchen. It makes for the perfect neutral rustic tablerunner. Lovely little curiosities you've put together. 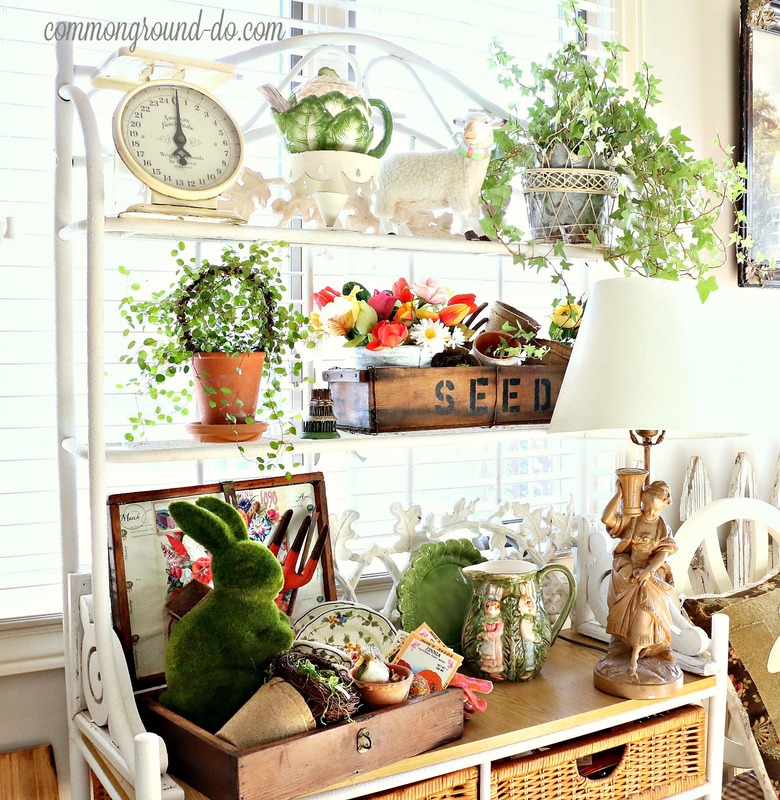 thankyou Linda, I love having places to play and decorate! Love all your florals and spring collections. The colors blend so well, but are really vibrant and appealing. What a pretty bright room. All your treasures show beautifully. You are very good at staging it all. 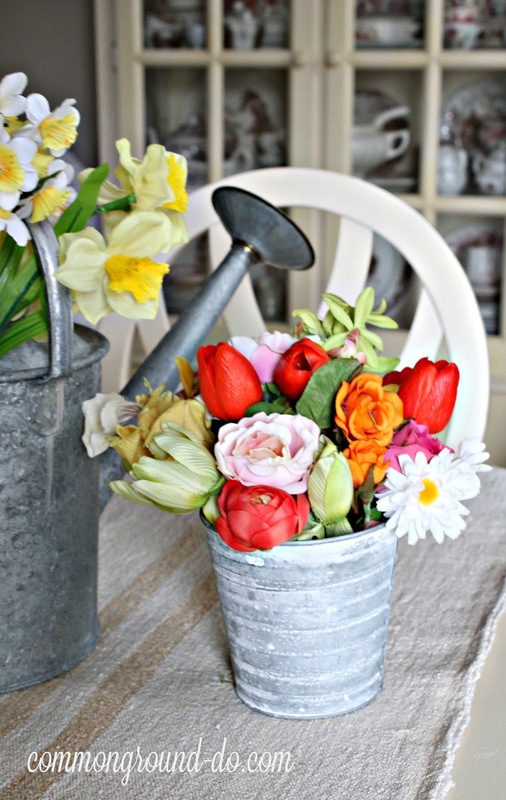 All the flowers are gorgeous, real or faux or both? Think I need to get bunch of little tete a' tetes at City Mkt. again for my galvanized pitcher. I miss having my bakers rack to decorate. It's in our mud room now next to computer desk. Have all my computer papers, all kinds of printing stuff on it along with big desk jet printer. Plus I keep bills due and bills paid containers handy on it. Your bakers rack looks really pretty. 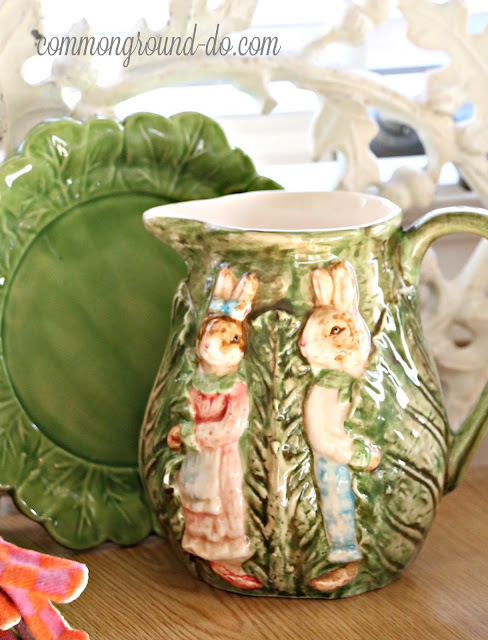 I didn't know what Majolica was til we moved to KY. Couple of dealers in Bowling Green indoor flea mkt. had lots of nice pieces. Loved going to that on weekends during winter especially. Love your burlap bunny pillow. 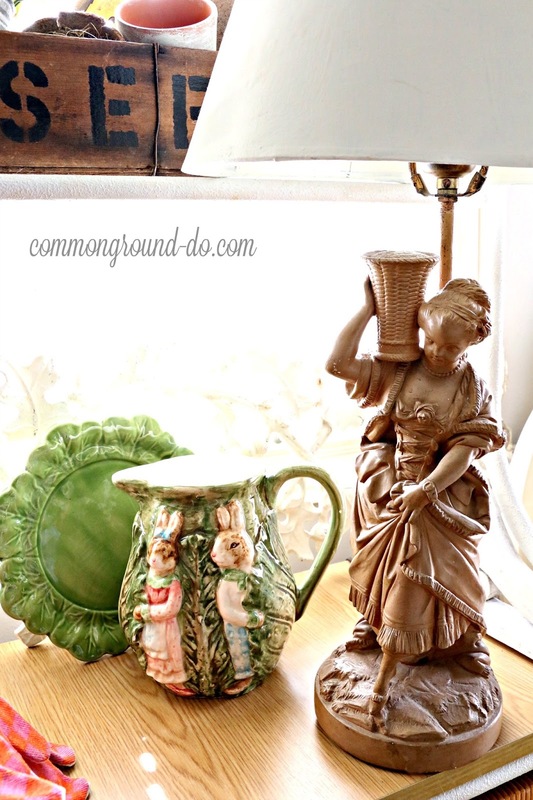 thankyou, that little pitcher is what I'd call "faux" Majolica. there's a vendor of the real deal Majolica locally, and some of their pieces are breathtaking, with a really breathtaking price. 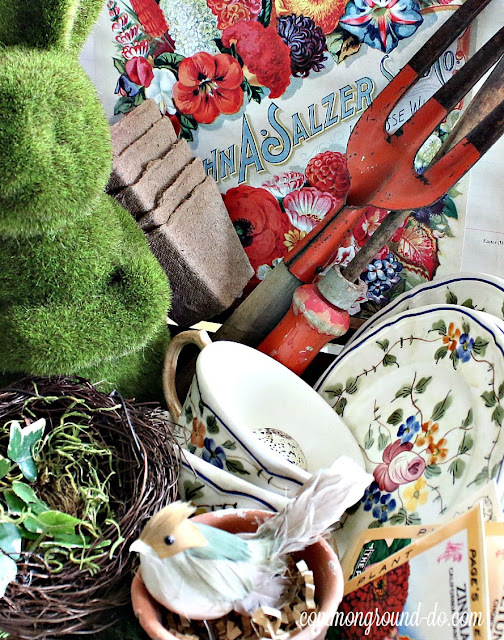 I have a few pieces of vintage types, but they are chipped. that's the only way I can afford the authentic Majolica. 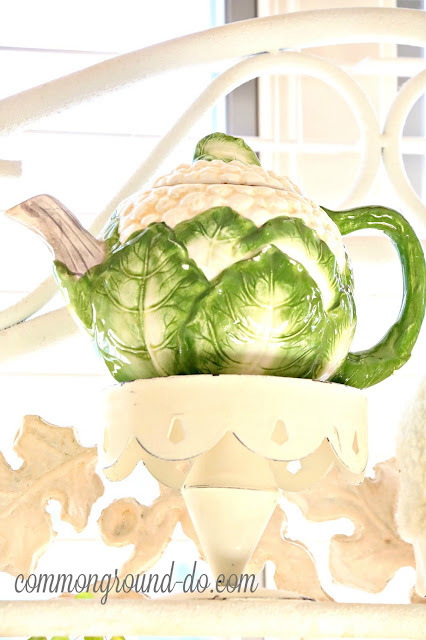 I love the concept of pottery that looks like plants, trees, veggies, birds and animals. Hope you're having a great weekend! 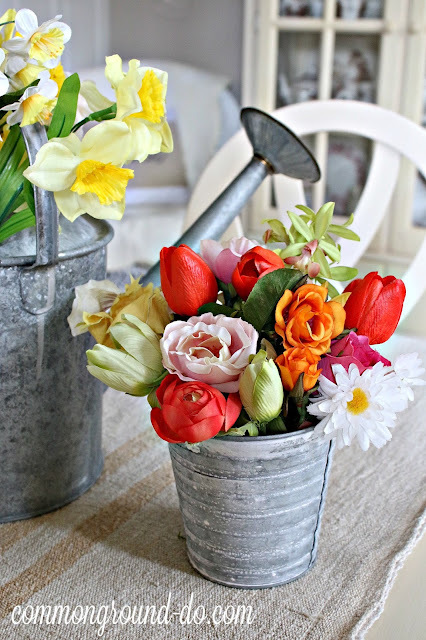 It's looking really Spring Like around your home. 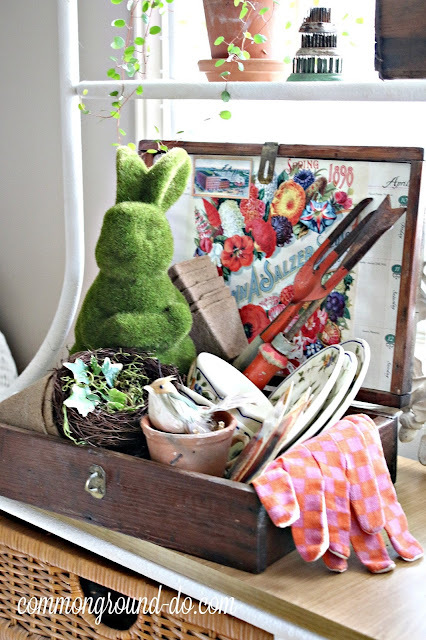 I love the seed box and that cute little green bunny. I love the way you have a knack for putting everything together so well. I also spied a sweet looking lamb among the flowers and pretties. Guess I'll have to get out a few more bunnies so I can have a "fluffle!" thankyou Sissie! I know, I forgot to take a close up pic of the lambie, I'll blame it on bad lighting! I always look forward to your seasonal decorating of the bakers rack - I just love everything on it. A fluffle - now how perfect a word is that? thankyou, don't you just love that word? fluffle. sounds all warm and sweet and cuddly! Love all of your spring touches, Debra...I think you get great light in spite of the gloomy wether so many of us are having. 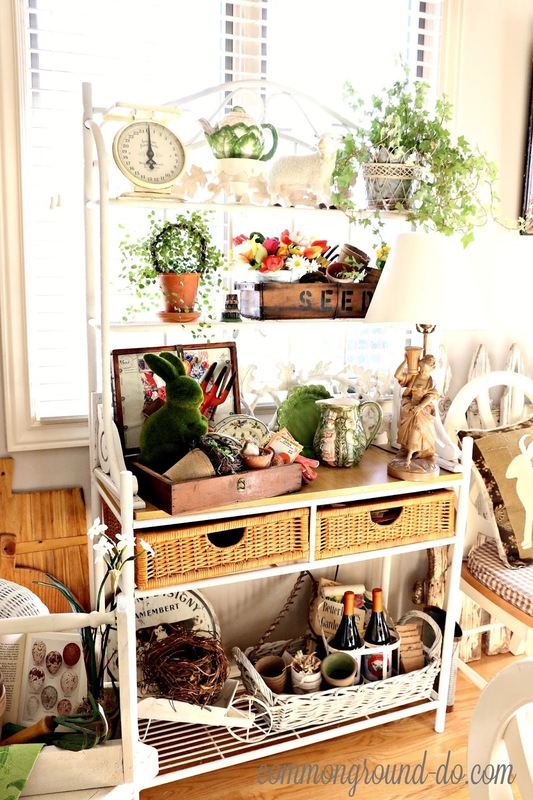 And your baker's rack...now that's some great sun and a wonderful, fresh spring look. Makes me want to start to fluffle right now! I like your galvanized buckets...I have one thats on the large side...maybe if I stick some baby's breath in to fill it out? Belle approche du printemps ! You just decorate things beautifully! And now that I know about fluffles, I cannot wait to display my own fluffle. Blessings. Pat. Love all the pretty plants and flowers, such a gorgeous arrangement on the bakers rack. 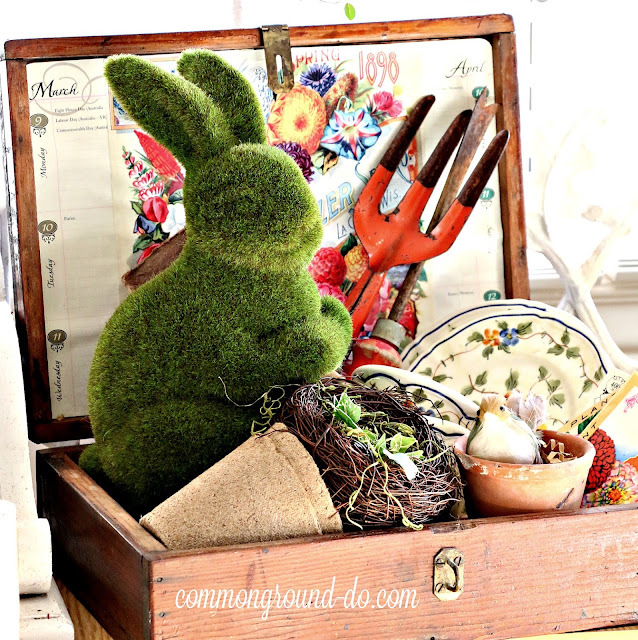 Love love love the mossy bunny! You've got so many pretty spring accent pieces, Debra! 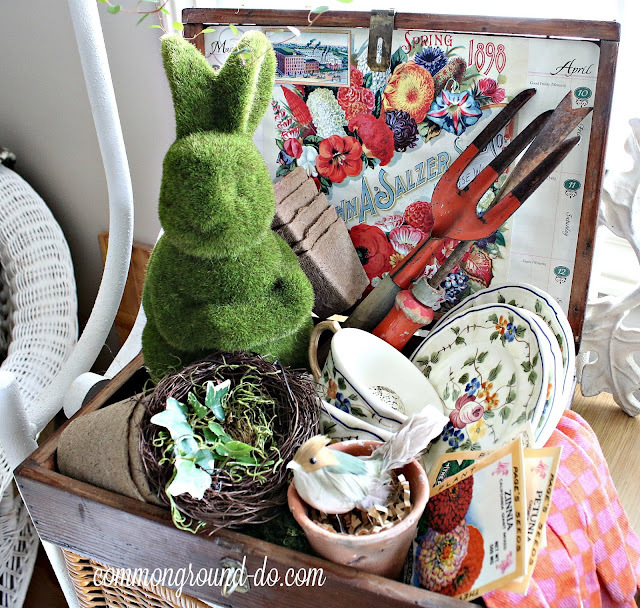 I love the way you've filled your seed box and the new moss bunny is the star of the show. 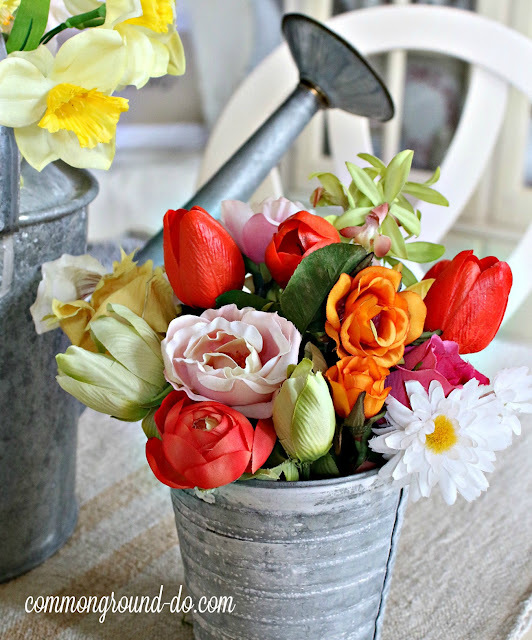 Love the bright spring flowers in the galvanized bucket, too! Yeah spring! 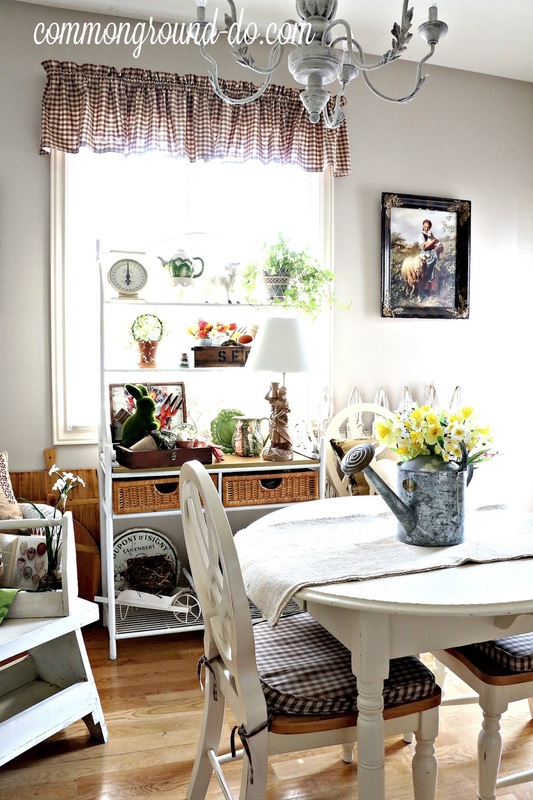 Your home is lovely and you've filled it with wonderful spring details. Thank you for linking your post to our Share Your Style Party. I love how you styled your spring bakers rack. 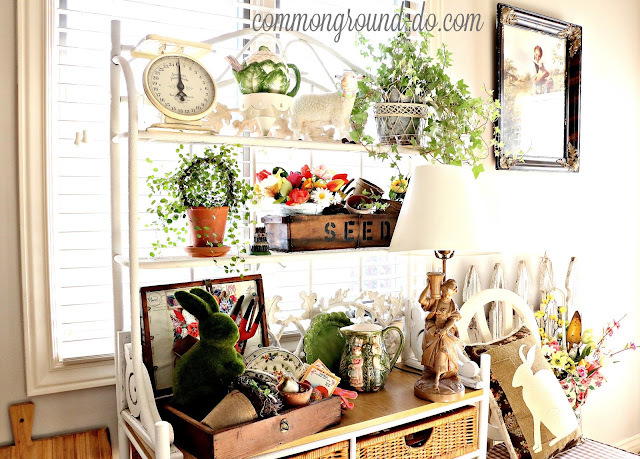 I have one on my screened porch and your ideas really inspired. Love! Love! 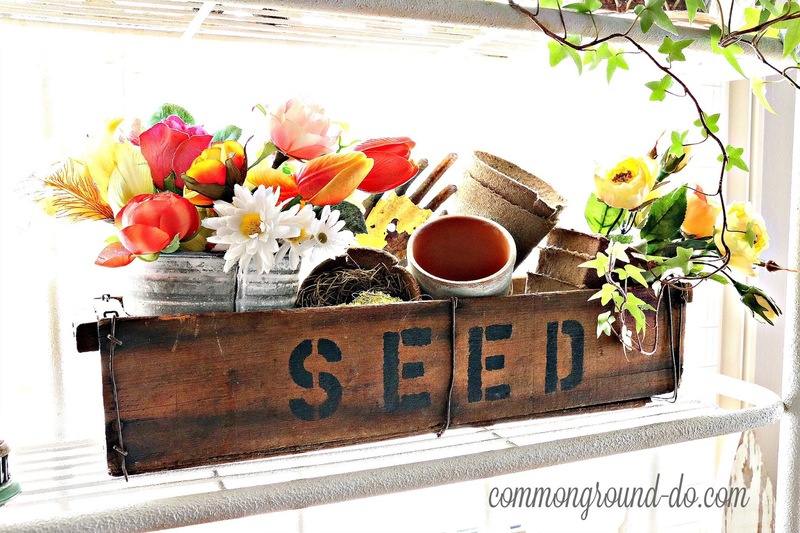 That seed box! So cute with everything in it..